G'Day, I don't know if you will read this in the sunny climes of Laos or in chilly Hanoi, but thanks mate for a great time ! I'm back at work and in the gym but I've still got memories, pics, videos and diary entries from my time there. I'll try to get back for another ride with you, maybe one day we could do Cambodia as well. The crew here at work are most impressed with the pic of you in the canoe with the bike lying down. 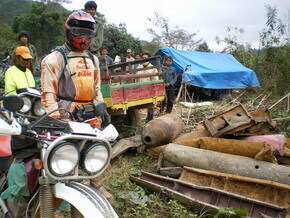 3500ks+, 12 days riding, Feb 6-17 2008. My adventure in Laos began on a Monday night with the guide greeting me in the Nalinthone Guest house in a traditional Laos method. He handed me a cold Beer Lao. We then went to a restaurant on the Mekong River for more drinks and he showed me "the dossier" as I call it. Details on the secret war in Laos. On the second day in Vientiane I met the two other riders for our group, both having flown in from Hanoi. Vietnamese Giang and Swiss Marcus. The three helped me immensely on the ride with their riding abilities, local knowledge, humour and stories of life in IndoChina. And also what to eat - which is very important to me ! We then organised the beasts to ride for the trip, fourstroke Honda XR250 Bajas. Just the bikes for this type of trip - 14 litre tanks for 420+ km range, front and rear knobbies, double headlights for night riding, enough power to lug us and our gear around for 3500ks+ on all sorts of terrain and surfaces, not demanding for any maintenance except for chain adjustments and one throttle cable replacement, able to ford deep rivers, and with that special feature to get us out of trouble - the electric starter. Enough power to cruise at 100kph on the highway or conquer the rough track obstacles. As we rode to various spots on the Ho Chi Minh trail "the dossier" came to life - the events, the rescues, the weapons, the locations, the names of rescued aircrew. The Special Operations. Saw beautiful rainforests, bamboo forests, mountains, lakes, streams and rivers. Sunrise above the karsts. Sunsets over the Mekong. We rode a remote mountain pass with a bomb and wrecked trucks lying next to the track; stayed in cities, towns and villages; ate and drank with the locals. Rode highways, byways, fourwheel tracks and rugged singleline tracks. Rode on dirt, tracks, gravel, sand and bitumen. In rivers, on riverbanks, over rice paddy fields, through villages, towns and cities. There is enough difficult terrain and long riding days to satisfy even the most experienced rider. Thanks guys for the ride of my life !